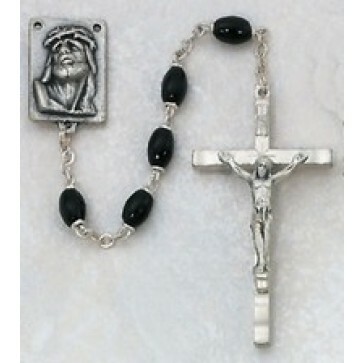 Elegant and sophisticated, the handsome black polished glass rosary is the perfect choice for everyday use. The rosary includes rich black oval beads that glide effortlessly through the fingers as the rosary is prayed. The piece is outfitted with a stunning center medal that depicts Our Lord with the Crown of Thorns to remind the user of the suffering He went through. The crucifix on the end of the rosary has a hammered finish that contrasts beautifully against the smooth glass exterior of the beads.